The decision to take a long hard look at your diet and introduce a new exercise regime into your life should not be taken lightly. After all you are making quite a commitment. The same is true if this new regime is going to involve joining a gym, or is that a health club or leisure centre. There are a number of tags that the marketing people at these ventures use, but the bottom line is that behind the free membership pack of towel and toiletries, along with the carefully worded PR brochure, there has to be a serious operation at work. You want to make sure that the pounds that are leaving your wallet are having a corresponding effect on the extra pounds around your waist and thighs. So before you commit yourself, take a long, hard look at the facilities that are on offer. And the personnel, too. 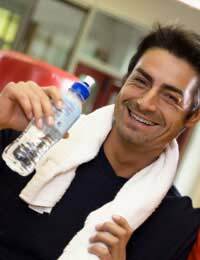 You’ll be turning to these people for advice on a number of exercise issues, so you want to make sure they have the qualifications that guarantee they know what they are talking about. In short, do your homework. And that includes taking an exercise timetable from a selection of centres in your area and studying them. The questions you should be seeking answers for? Well, what’s the range of classes available? Do they meet you immediate requirements, and are there a range of levels so that you can make progress? What about the timings; do they suit you? Mid morning sessions are all very well for housewives and house husbands with time to kill after the school run, but those working to a 9-5 schedule and beyond are going to need early morning and evening classes. What classes are running at the weekend? This is the period when many people have more time to make the gym, so adequate provision should have been built in to accommodate this by the centre’s organisers. If you are planning to join as a family, does the gym have a swimming pool so that one parent can take a class while a spouse or friend keeps the kids amused in the pool. Family pressures should not be underestimated because juggling gym sessions with child care can be one of the reasons why attendance falls away. No one is suggesting that the gym should come before the children, but in investing in a membership you are also making an investment for your children who will be able to share in the happier, healthier, new you that results from your exercise regime. Take a look at the weights facilities. Is there a good range of free weights and machines? And what about a hall for five-a-side football or racket sports? These will provide a refreshing change from your regular exercise programme while still contributing to overall fitness. A welcoming bar or restaurant should not be underestimated, either. Not because you want somewhere to replace the pounds that you’ve just sweated away. Rather they are a place to relax and chat with fellow class members, may be pick up some good tips on techniques or other workouts. What about the location of the gym? You want to make sure that it is easily accessible. A 20- or 30-minute drive is all the excuse some people need to skip a class and stay at home, curled up on the sofa. Memberships vary in price, so be sure that you are getting value for money, and that there are no add-ons you are unaware of. If money is tight, check whether off-peak membership is available that offers admission outside of periods of high demand. It may not be as convenient but it could keep costs down. When you are satisfied with every aspect of your new fitness centre, then sign on the dotted line and get started. It will represent one of the best investments that you will ever make.